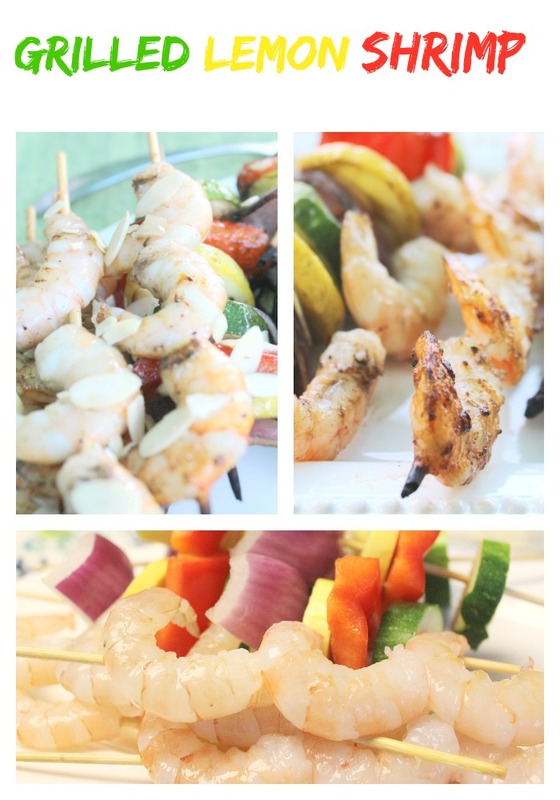 Grilled Lemon Shrimp and Vegetables is an easy meal but fancy for a quick summer dinner. In the summertime I like to make meals that are easy to put together, doesn’t heat up the kitchen and has wonderful taste. 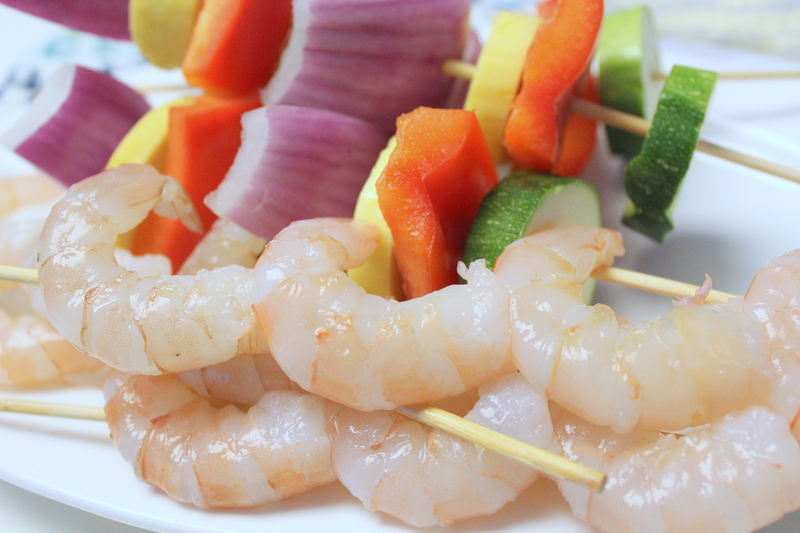 When you make Grilled Lemon Shrimp and Vegetables, start with beautiful shrimp and vegetables of your choice. Soak skewers in water for about 15-30 minutes. Skewer the shrimp. Place the vegetables on a different skewer because they will cook at different temperatures. Green and yellow zucchini, red peppers, red onions are a great choice for the grill. Place the vegetables on their own skewers because they cook at a different rate than the shrimp. Grilled corn on the cob also makes a great option for the grill. Make the basting coating for the shrimp and vegetables. The basting coating consists of softened butter, lemon juice, salt, pepper, granulated garlic, paprika and slivered almonds. 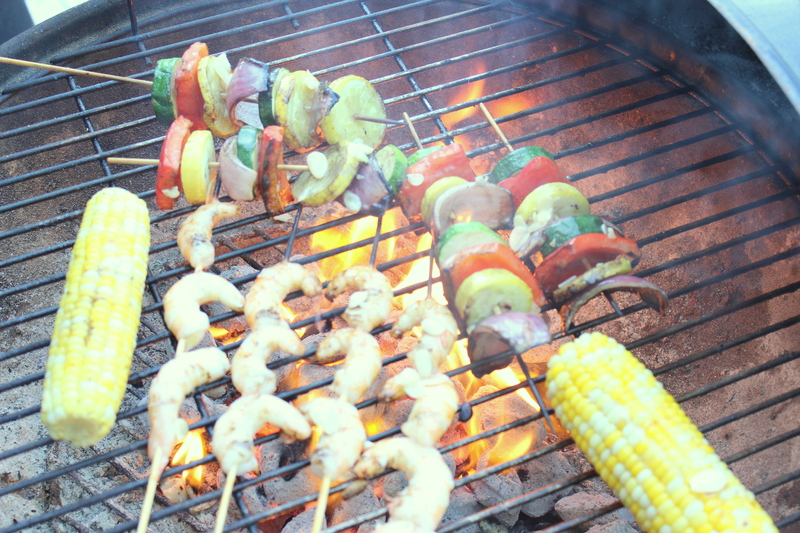 Thoroughly coat all the shrimp and vegetables and place the vegetables including the corn on the grill. After the vegetables are almost cooked, place the shrimp on the grill. Grill the shrimp for about 5 minutes on each side. Grill the Shrimp and Vegetables on a Charcoal Grill or Gas Grill. The flame that you get will cook the shrimp very quickly. Cook the vegetables first and set aside and then grill the shrimp. Charcoal grill should be started ahead of time, a gas grill can be turned on a few minutes before grilling. Soak wooden skewers in water for 15-30 minutes. Make the butter mixture by combining the softened butter, lemon juice, garlic, paprika and salt and pepper. Generously coat the shrimp and vegetables with butter mixture. Cook the vegetables until almost done about 10 minutes. Add the shrimp skewers to the grill and cook for about 5 minutes on each side. Brush with additional butter mixture and serve. Thank you! The basting coating was good but tended to melt off. It would be great to have some extra coating and to brush the shrimp and vegetables again right before serving.